Brown Brown: Google It, You Moron! Internet Lesson 101: Always check Google before asking a question. 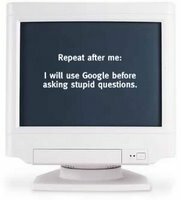 This site, www.googleityoumoron.com, was started February 28th 2005, by Josh Powell because he was sick of people asking stupid questions without bothering to search Google first.